Economic crisis alone won’t end US imperialism. Only a political threat from below can do that. Capitalism was once considered the epitome of economic evil, to such an extent that until recently the very word was avoided by its practitioners or apologists; it was the system that dared not speak its name. “Freedom” was the preferred euphemism during most of the twentieth century. No longer. Capitalism has outed itself and, despite its troubles, is now lauded by banker and politician, portentous pundit and airhead breakfast TV host alike, on the grounds that no alternative is or ever could be desirable. Therefore the least departure from capitalist norms on any continent, however moderately expressed or practiced, arouses the frenzy of the privileged and their retinues. Fear of the unexpected — uprisings, electoral revolts that challenge the status quo, street protests by the young, peasant jacqueries — compels the global elites to depend, in the last instance, on the threat or use of US military strength to settle every dispute in their favor. This creates a level playing field for the global rich alone, regardless of the resulting slaughter. Baghdad, Helmand, Tripoli, Kinshasa tell the tale. Not since the interwar years has conflict been incited so shamelessly, and with such frightening frivolity. The combination of unchallengeable military power and the political intoxication it produces sweeps all else to the side. What the whole world knows to be false is proclaimed by the United States to be the truth, with media networks, vassals, and acolytes obediently in tow. The triumph of crude force is portrayed as a mark of intelligence or courage; criminal arrogance is described as moral energy. Of course, such aggression doesn’t always succeed politically and, in most cases, the chaos it unleashes is much worse than what existed before. But the economic gains are palpable: the privatization of Libyan and Iraqi oil are the most salient examples. How can hope be sustained in such a world? First, by shedding all illusions about the capacity of the rulers of the world to reform themselves. The conditions and circumstances that have enabled US imperial power to reach its present level of ascendancy are hardly a secret. And the questions currently being debated are extremely relevant. What are the limits of US power? What factors might contribute to its decline? How is US hegemony exercised today? The answers would take into account America’s size, natural resources, technology, manpower, and military superiority, compared to those of its economic rivals, and also consider how long domestic consent to such an existence is liable to continue. A well-meaning, if obvious, shortcut is to indulge in wishful thinking, which comes in various guises. The simplest of these queries the very notion of an imperial United States of America, especially after the collapse of the Soviet Union. 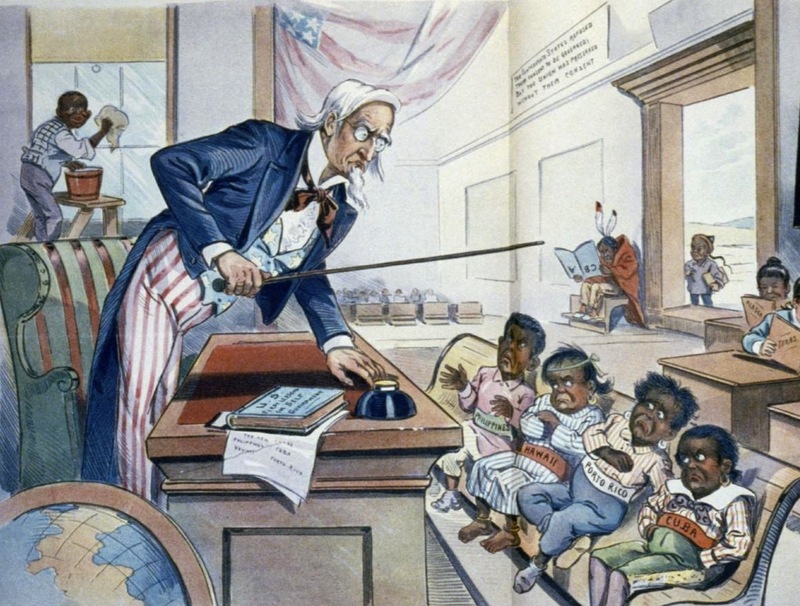 Some write of the differences between the old European pattern of colonization and the current variant, employing a sleight of mind to give Washington a clean bill of health. The political literature on the decline and coming fall of the American Empire has proliferated in recent years, and is equally unsatisfactory. There is an air of desperation. Setbacks are interpreted as crushing defeats, while deluded hopes fasten onto the rise of China, or Putin’s Russia, or even onto political Islam. In reality, the imperial highway is unconquered and unconquerable from without; the only serious exit route lies within the country. What combination of social forces at home can defeat the labyrinthine power structures of the United States? However bleak such a vision might appear at the moment, there is no other on the horizon. A “good” patriot today is made to feel that she must, of necessity, also be pro-imperialist. More skeptical citizens who believe that the Empire’s military bases should be dismantled, its troops brought home, its military expenditure reduced, and America itself redefined as just a large state among others, only using force when it is directly threatened, are viewed as “bad” patriots, which is to say, little more than backstabbing traitors. They are by default the enemy within. They are regarded as such not only at home, but also by those who fear US withdrawal abroad: vassal politicians and states in Europe, Asia, the Middle East, Africa, and the loyal few in South America. The rulers of the only vassal continent — Australia — would, given its geography, be equally disturbed to contemplate independence. Yet in both the Arab world and the heartlands of Western capitalism, the systemic order imposed through the Washington Consensus since the collapse of the Soviet Union has appeared to be in forward flight. The Arab world seeks to escape its recent history, while some European states, in the grip of parliamentary paralysis, dream of external deliverance from the very bankers who were responsible for the crash of 2008. The atrophy of the productive economy in the United States and large swathes of the European Union reveal a malady that was already at an advanced stage, even as some claimed that the disease had been defeated forever. In response, the optimists argued that the US was confronted by an involution similar to the one that had afflicted Britain at the heyday of its empire. Questions long treated as defunct began to be raised again, if only on the margins of the political system. The impact of this doubt on popular consciousness has spread rapidly. The events have laid bare the weaknesses of the system, exposed its bald patches, and revealed yet again that the motive force underlying empires, wars, and conquest for the last two thousand years is not ideology, but the drive to accumulate and monopolize the distribution and flow of wealth by all necessary means. The struggle to extract and transport gold and silver may have been replaced by split-second, push-button transfers on tiny machines, like the Thompson gun has been replaced by the drone, but the masters of our world are playing the same ruthless game as their forebears. 2011 witnessed the concatenation of two crises. One was symbolized by the spate of Arab uprisings challenging indigenous and Western-backed despotisms in the name of freedom. These events were much more reminiscent of the 1848 upheavals in continental Europe than of the “springtime of the peoples” of 1989, which effectively exchanged one form of dependence for another, seeing in neoliberal capitalism the only future. The other blew in like a breeze through public spaces and university campuses once again, and the noise of mass uproar could be heard on more than one continent. Mediterranean Europe in particular was engulfed by general strikes and mass mobilizations numbering millions. Do these disruptions herald the birth of a new social order, inside or outside capitalism? The answer from the upper classes is a resounding “No.” They have been hard at work using the state to bail out (Europe) or stimulate (US) the existing neoliberal system. The notion that there might be a managerial revolt from within the system, a technocrats’ uprising, belongs to the realm of science fiction. It has no precedent in history. Any change from above or within the existing structures is unlikely, unless the threats from below become too strong to resist. The democratic shell within which Western capitalism has, until recently, prospered is showing a number of cracks. Since the nineties democracy has, in the West, taken the form of an extreme center, in which center-left and center-right collude to preserve the status quo; a dictatorship of capital that has reduced political parties to the status of the living dead. How did we get here? Following the collapse of communism in 1991, Edmund Burke’s notion that “in all societies consisting of different classes, certain classes must necessarily be uppermost,” and that “the apostles of equality only change and pervert the natural order of things,” became the wisdom of the age, embraced by servant and master alike. Nevertheless, money corrupted politics. Leading politicians of the extreme center became rich during their years in power. Many were given consultancies as soon as they left office, as part of a “sweetheart deal” with the companies concerned. Throughout the heartlands of capital we have witnessed the convergence of political choices: Republicans and Democrats in the United States, New Labour and Tories in the vassal state of Britain, Socialists and Conservatives in France, the German coalitions, the Scandinavian center-right and center-left, and so on. In virtually each case the two-party system has morphed into an effective national government. The hallowed notion that political parties and the differences between them constitute the essence of modern democracies has begun to look like a sham. Cultural differences persist, and the issues raised are important; but the craven capitulation on the fundamentals of how the country is governed means that cultural liberals, in permanent hock to the US Democrats or their equivalents, have helped to create the climate in which so many social and cultural rights are menaced. A new market extremism has come into play. The symbiosis between politics and corporate capital has become a model for the new-style democracies. It was the politicians who ushered private capital into the most sacred domains of social provision. As 2014 drew to a close, how did the United States fare? Far from appearing overstretched or on the verge of collapse, America was conducting business as usual across the world. The NATO intervention and “victory” in Libya was carried out via a monopoly of air space, sealing Africa Command’s first military triumph, setting the tone for dealing with the rest of the continent in the decade that lies ahead. The Arab East remains unstable; nevertheless, the moderate Islamist forces in the region are only too happy to accommodate most imperial needs, with the odd disagreement on Israel largely for show and not reflecting any fundamental shift in policy. The Taliban and ISIS will do the same when the time comes. Meanwhile, the oil giants — BP, Chevron, ExxonMobil, Shell, and ConocoPhillips — netted profits in the region of $900 billion over the last decade. Elsewhere further advances are dotted on the world map. The traditionally servile Australian elite agreed to a new US military base in Australia with alacrity. This was accompanied by hard anti-Chinese talk in which President Obama underlined the imperial presence in the Far East, stressing that the US was an Asian power and warning the Chinese to “play by the rules of the road.” These are rules that the Chinese know are formulated, interpreted, and enforced by the US. Elsewhere, only South America has experienced a rise of political resistance to imperial hegemony, both political and economic. This is the first time since the Monroe doctrine that four states are without US ambassadors: Cuba, Venezuela, Ecuador, and Bolivia. The largest state in the region, Brazil, has asserted a degree of independence lacking in recent decades. State Department functionaries visit Brasilia regularly to reassure the political elite that “Obama is not Bush,” a message greeted with some skepticism. It is hardly a secret that Obama/Clinton approved the coup in Honduras and that death squads are back in favor. Plans to destabilize the Bolivarian states and topple their governments have not been abandoned, as the 2012 overthrow of Fernando Lugo in Paraguay revealed. Washington searches out the weakest link in the enemy camp and then proceeds to destroy it, with military force when necessary, but preferably by using local relays and manipulating the system, as in Asunción, and in Venezuela after Chávez succumbed to cancer. To think that the military-political leadership of the United States is preparing to go back home after organizing a soft dismantling of its overseas empire is eminently comforting and wholly untrue. Tariq Ali is an editor of New Left Review.